Firestone Walker Brewing Company was founded in 1996 by Adam Firestone (aka the Bear) & David Walker (aka the Lion), and began as a small brewery with roots in wine country on California’s Central Coast. 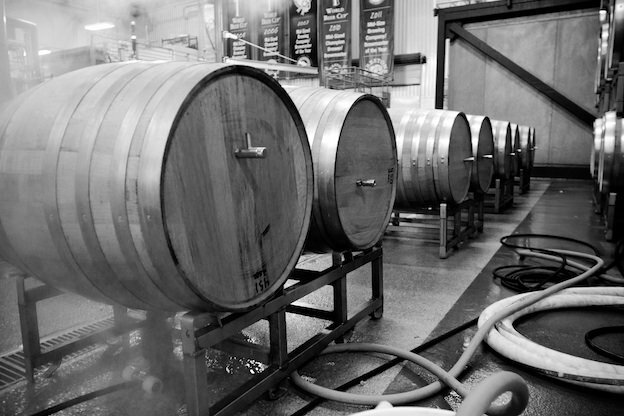 Part of their claim to fame comes from the fact that some of their beers, such as their signature dba (double barrel ale), are partially fermented in oak using a Burton Union system (they call their system the 'Firestone Union'). 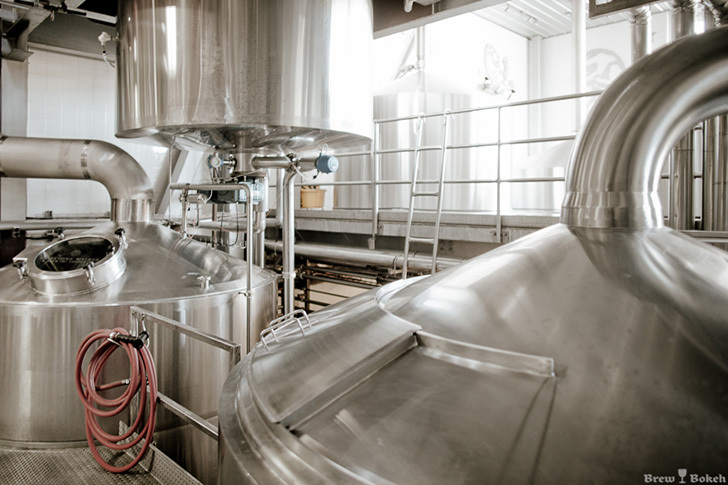 They are one of only two brewers in the world to still use a commercial-sized Burton Union system. 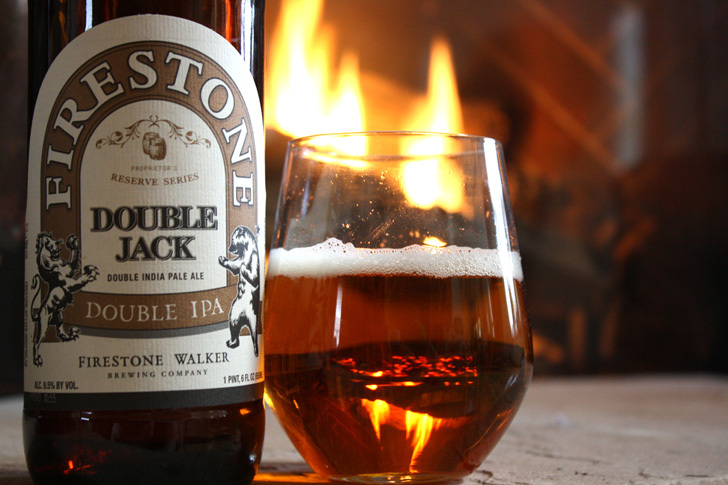 Double Jack however (Firestone Walker's first Imperial IPA), is fermented entirely in their stainless steel vessels. It features a big malty middle to cloak the high alcohol (9.5% ABV) and mouth puckering (albeit smooth) hop bitterness. This is a beer to be consumed in moderation as it does not taste like a nearly 10% ABV beer. Double Jack started out as a special release in 2011 but has been available almost full time ever since. Taking inspiration from their Union Jack IPA, Double Jack keeps the grain bill breakdown the same but increases the amounts for a higher alcohol beer. Hops were also increased (and modified slightly) to create a beer that showcases the extreme side of American hops, making a beer that is explosively flavourful and yet integrated and immensely drinkable. It is fermented using English Fullers yeast available in liquid form as either Wyeast 1968 London ESB Ale or White Labs WLP002 English Ale. Many commercial breweries brew their American style IPAs using English yeast as the slightly fruity/estery profile compliments the citrus, pine, and fruity aromas of American hops. It's a combination that works well. Like Pliny the Younger, the quadruple dry hopping takes time and you have to be very careful not to oxidize the beer. To minimize contact with air, always purge the headspace with CO2 every time after you open up the vessel. Do the same whenever racking by purging the target vessel with CO2 first. Like all hop forward beers, consume this beer fresh. Firestone Walker recommends it be consumed within 120 days of bottling/kegging. The sooner the better of course. Within a month or so would be ideal, similar to what Stone recommends with their 'Enjoy By' double IPA (batch #171). I first brewed this on September 25, 2014 (batch #178). Brew up a batch and let me know how you like it! 60-90 min fly sparge with ~5.6-5.8 pH water (measured at mash temperature). Collect 14.6 gallons (@68F) in the boil kettle. Cool wort to 65-66F and aerate extremely well. Pure oxygen from a tank can help. Aerate again ~12 hours after pitching. Ferment at 65-66F for ~7 days. Do not ferment too cold initially as we want some of yeast derived fruity esters here that this English yeast is known for (it compliments the hops). Raise to 70F, add dry hop #1 and hold ~5-7 days, then rack to CO2 purged brite tank (secondary) or directly to keg (if you keg). This yeast will have already dropped leaving a brilliantly clear beer without need of any clarifiers. Add dry hop #2 and hold 3-4 days. Gently swirl 2-3 times/day. Add dry hop #3 and hold 3-4 days. No need to remove previous dry hops first. Gently swirl 2-3 times/day. Add dry hop #4 and hold 3-4 days. No need to remove previous dry hops first. Gently swirl 2-3 times/day. Remove all dry hops. Package as you would normally. I keg and carbonate on the low side (around 2 to 2.2 volumes of C02) to minimize carbonic bite and let the hop/malt flavours come through. Yes. Chris at BertusBrewery has some fantastic information/recipes. It's a subtle tweak but for all intents and purposes pretty much the same. Firestone Walker gives a ton of information on their website as to exactly what grain and hops are used and they've even published their mash schedule (! ), so it's pretty straight forward to figure out. I respect Chris's input/recipes a lot. Wow, that's a ton of hops!! While following the dry hop schedule do you leave the fermentation temp at 70º after the first addition or do you cool it down? I do it at room temp. Drop hopping takes longer at colder temps. Just added my last hop addition. Smells great and looking forward to it. One observation that I noticed is that I filled the kegs a bit too much as each hop addition using keg dry hop containers like Kal mentioned, feel free to modify this for links, are really floating. Working quite well though. Going to brew a batch of this up tomorrow to have for the holidays. Will report back! This was an excellent IPA. Certainly quite hoppy, but still quite a smooth finish. Quick question. So I brewed this two weeks ago and have done the first dry hopping in the fermentor. I don't have a bright tank so can I just do the additional dry hoppings in the keg? I purchased the SS dry hopper so I will use that but just wanted to see where others have done it. Also, do you carbonate during the additional dry hoppings or keep it off the gas? I'm afraid of introducing too much oxygen from opening and closing the keg lid to add the hops. Last question is how strict are you on sanitation when adding the dry hops? Usually when i dry hop, I will have the exact ammount i need in the vacuum sealed pouch that i soak in star san for a few mins before I cut it open and add them. Now I have been purchasing larger hop quantities like you and freezing them, are you not afraid of contamination when adding additional dry hops to the fermentor/keg? Is the risk mostly negated by the fact there is not much sugar for any bad bacteria to fead on and that usually it is in a low oxygen high CO2 environment? Just want to make sure I am not missing anything and introducing additional risk of infection while i dry hop. Thanks in advance for your help. So I brewed this two weeks ago and have done the first dry hopping in the fermentor. I don't have a bright tank so can I just do the additional dry hoppings in the keg? Sure. You don't need anything officially called a 'bright tank' either - I will often use 5 gallon carboys. I prefer letting the hops float around instead of using SS dry hoppers (which I have also used) as I find the hops just clump up. I like to let them move freely and will give the carboy a swirl a few times/day. Also, do you carbonate during the additional dry hoppings or keep it off the gas? You can, if you're dry hopping in the keg. Up to you. I'm afraid of introducing too much oxygen from opening and closing the keg lid to add the hops. You can always give hook up the gas and it a burp of CO2 after opening/closing by pull the pressure release valve. Last question is how strict are you on sanitation when adding the dry hops? I'm not at all. Nothing grows on hops. Nothing grows at 0'F in the freezer. The beer has alcohol so it's somewhat protected. Now I have been purchasing larger hop quantities like you and freezing them, are you not afraid of contamination when adding additional dry hops to the fermentor/keg? I'm sure they're not sanitizing those yellow buckets beforehand in any way. Google "infection from dry hopping". LD/DR: It's not really possible. Hops are naturally anti microbial. Great, thanks for the detailed response Kal. I bought the SS dry hopper so I guess I will give it a try and make sure I stir vigorously a few times a day. You also state not to use any gelatin to clarify, if I just dry hopped in the keg under co2 at 70f, the hops should drop out naturally and will be pulled off in the first few pints? I bought the SS dry hopper so I guess I will give it a try and make sure I stir vigorously a few times a day. You also state not to use any gelatin to clarify, if I just dry hopped in the keg under co2 at 70f, the hops should drop out naturally and will be pulled off in the first few pints? Most of the hops should stay inside the SS dry hopper so they'll come out when you pull it out. If some do fall out, they'll settle out like you mentioned. Cheers!